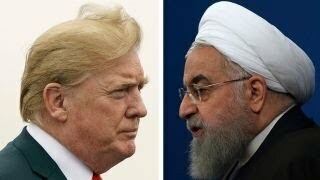 Tensions are escalating between the U.S. and Iran after the Trump administration re-imposed economic sanctions against Iran last week. This news followed Trump's decision to withdraw from the Iran nuclear deal. Trump has threatened other countries seeking to trade with Iran, tweeting, "Anyone doing business with Iran will NOT be doing business with the United States." Iranian President Hassan Rouhani condemned the sanctions as "psychological warfare," saying last week he would not begin negotiations until the sanctions are withdrawn. We speak with Ambassador Seyed Hossein Mousavian, Middle East security and nuclear policy specialist at Princeton University's Woodrow Wilson School of Public and International Affairs. He served as spokesperson for Iran in its nuclear negotiations with the European Union from 2003 to 2005. AMY GOODMAN: This is Democracy Now!, Democracynow.org, The War and Peace Report. I'm Amy Goodman. We begin with a look at escalating tensions between the United States and Iran. On Sunday, the U.S. Ambassador to Britain, Woody Johnson, wrote an op-ed in The Telegraph urging Britain to withdraw its support of the landmark 2015 Iran nuclear deal. Ambassador Johnson wrote, "America is turning up the pressure and we want the U.K. by our side." Johnson's op-ed comes after the Trump administration re-imposed economic sanctions against Iran last week following Trump's decision to withdraw from the Iran nuclear deal. The sanctions increase tensions between the U.S. and Iran, and the U.S. and its European allies. Trump has threatened other countries seeking to trade with Iran, tweeting "Anyone doing business with Iran will NOT be doing business with the United States." Iranian President Hassan Rouhani condemned the sanctions as psychological warfare, saying last week he would not begin negotiations until the sanctions are withdrawn. PRESIDENT HASSAN ROUHANI: The first step would be for U.S. President Donald Trump to show that he genuinely wants to engage in negotiations to solve a problem. What's the meaning of negotiations when you impose sanctions at the same time? It's like someone pulling a knife to stab a rival or an enemy in the arm while at the same time claiming we should be talking and negotiating. The answer in such a case would be to say, "Remove the knife from the arm and put the knife away." PRESIDENT DONALD TRUMP: I do believe that they will probably end up wanting to meet, and I'm ready to meet any time they want to. And I don't do that from strength or from weakness; I think it is an appropriate thing to do. If we could work something out that's meaningful, not the waste of paper that the other deal was, I would certainly be willing to meet. PRESIDENT DONALD TRUMP: No preconditions. No. If they want to meet, I'll meet. Any time they want. Any time they want. It's good for the country, good for them, good for us and good for the world. No preconditions. If they want to meet, I'll meet. AMY GOODMAN: Only hours later, Secretary of State Mike Pompeo announced a slew of preconditions for a possible meeting, including Iran being willing to enter into a new nuclear deal. Well, for more, we're joined now by Ambassador Seyed Hossein Mousavian, Middle East Security and Nuclear Policy Specialist at Princeton University's Woodrow Wilson School of Public and International Affairs. From 2003 to 2005, he served as spokesperson for Iran in its nuclear negotiations with the European Union. He is author of The Iranian Nuclear Crisis: A Memoir and most recently, Iran and the United States: An Insider's View on the Failed Past and the Road to Peace. Ambassador, welcome back to Democracy Now! Thank you for joining us from Princeton University. Why don't we start off with the latest news? You have the U.S. Ambassador to Britain Woody Johnson pressuring Britain to pull out of the U.S. nuclear deal following the United States, which Trump did, and the imposition of sanctions by the United States last week on Iran.